Autodesk is pleased to announce the availability of InfraWorks 2019.1. This software supports connected BIM (Building Information Modeling) processes, enabling designers and civil engineers to plan and design infrastructure projects in the context of the real world. - Delayed model regeneration for road design reduces the number of times a model regenerates by allowing the designer to delay regeneration until after edits to a roadway's horizontal and vertical alignment or components are complete. - The Curve Properties Panel in profile view has always displayed geometric values of a selected vertical curve. Now, values such as K-value can be modified, and immediately reflected on the profile view from the Curve Properties panel. - Improved spiral curve spiral support for InfraWorks to Civil 3D interoperability. In InfraWorks, users can only create roads with clothoid spiral types. However, if spiral types other than clothoid are imported into InfraWorks from Civil 3D, InfraWorks does maintain those spiral types when the centerline geometry is edited but the spiral types can not be changed. Previously, if the centerline geometry of a road from Civil 3D was edited in InfraWorks, all the spiral types in the road would have been converted to clothoid. - The spiral type is now displayed in the Spiral In and Spiral Out sections of the Stack when a Spiral-Curve-Spiral is selected. - Use your ESRI ArcGIS login information to connect InfraWorks to your ArcGIS online data. - Browse available datasets and add ArcGIS data layers to your InfraWorks models as features. - Customize the display of ArcGIS data source attributes in the InfraWorks Stack. - Refresh InfraWorks features to pull updates from the ArcGIS data source. - Choose whether or not to include Bookmarks with Shared Views. Use them to set locations you can navigate to quickly. - Choose whether or not to make detailed model data (asset properties) available with a Shared View, so that stakeholders can review specific data about infrastructure assets. - When opening, publishing or syncing an InfraWorks model with BIM 360, you'll now see both the Account and Project names so that you can more easily choose the correct place for you model. - Add piers to any location along a bridge's length using the right-click context menu. - Change the number of piers on a bridge without resetting girder attributes for existing girder groups. - Set the edge of the bridge deck above the roadway surface when using bridge deck assemblies from Autodesk Inventor. - Set deck continuity at each individual pier. - Use parametric part assemblies created in Autodesk Inventor as deck and girder components in Autodesk InfraWorks. - Model and design parametric tunnels in the context of your overall infrastructure design project. - Send your InfraWorks tunnel to Revit for detailed design. - Author custom parametric tunnel sections in Autodesk Inventor, for use in Autodesk InfraWorks. About Autodesk InfraWorks. 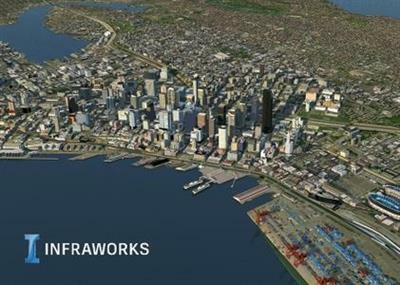 Autodesk InfraWorks is the geospatial and engineering BIM platform that enables parametric model-­based planning and design of civil infrastructure in the context of the real-­world. With InfraWorks users can more easily evaluate and convey design intent within the context of a project's surroundings; data can be aggregated from various sources and design decisions made earlier in the project lifecycle;~ then, the design model can be moved downstream to AutoCAD Civil 3D for detailed design and construction documentation with minimal loss of critical information - improving decision making, project stakeholder buy-­in, and saving both time and money. Note: Your models from the previous release will need to be upgraded to the new 2019.1 release build. It is strongly recommended that you backup your models before upgrading.